I wasn’t sure what I wanted to do after graduating from Kennebecasis Valley High School in 1998. I enjoyed environmental science and after some thoughtful advice from Vicki Atkinson, an influential chemistry teacher at the time, I enrolled in a Biology B.Sc. program at Mount Allison University. I spent many hours hiking around the vast marshlands of Sackville while I was a student at Mount Allison, watching shorebirds in summer and snowy owls during the winter. I began to develop an interest in the ecology of birds and was fortunate to land a summer job with Bird Studies Canada studying the Bicknell’s thrush; a rare and elusive species that inhabits damp high elevations in the Maritimes. During my time in Sackville, I began to recognize that wildlife ecology was simply ‘bird geography’ and that many ecological mysteries required a strong GIS toolset to answer. Once I graduated with a B.Sc. degree I enrolled in the Advanced GIS diploma program at COGS. The COGS program gave me the foundation that I needed to tackle complex spatial data challenges and answer ecological questions. I worked for Bird Studies Canada for another summer after graduating from COGS in 2003. While working for Bird Studies Canada I became fascinated by cryptic and nocturnal species like owls. I canvassed academics across Canada that had worked on owls, and of the dozens that I contacted Dr. Susan Hannon was willing to take me on as a Masters of Science in Environmental Biology and Ecology at the University of Alberta. My research focused on barred owl habitat use in the boreal fringes of central Alberta. The project included trapping and tagging barred owls, and following their movements between woodlots using radio-telemetry. It was an intensive field program and required many long nights on ATVS. 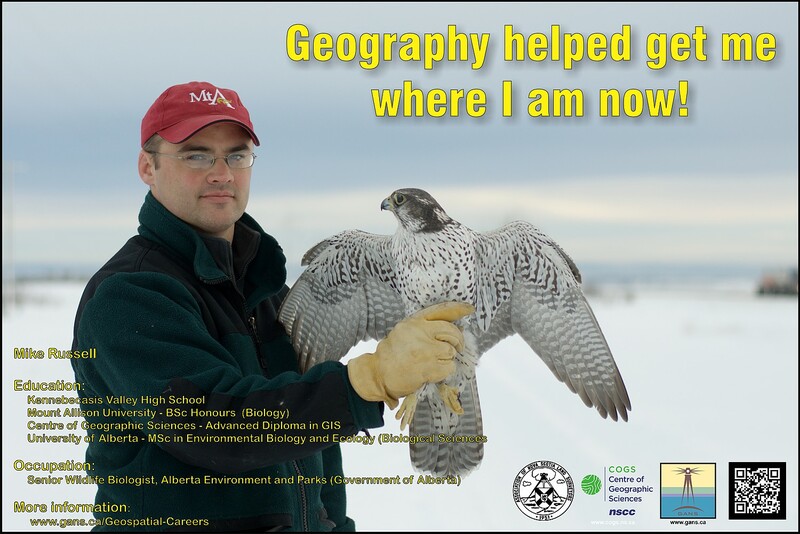 Before finishing my Master’s degree I was hired as a regional biologist for Alberta’s Fish and Wildlife Division. I am now a Senior Wildlife Biologist for the Peace Region and am responsible for working with all wildlife species in northern Alberta including caribou, cougars, wolves, mountain goats, bighorn sheep, birds, and bears. My expertise in the spatial ecology of animals with a heavy foundation in geography concepts continues to prove invaluable in my job as a wildlife manager. I continue to use the skills I learned at COGS on a daily basis whether it is developing a species habitat model, evaluating the impacts of land use development on wildlife habitat, or creating digital maps to guide navigation during helicopter surveys. I also continue to study owls and hawks both professionally and in my spare time.